HindSite’s HVAC service software is designed to make you more efficient. HindSite includes marketing, sales and estimating, scheduling, routing, field data collection, billing, reporting, customer communication and GPS tracking features designed to help you grow your HVAC business. Run an efficient HVAC business. HindSite's intelligent scheduling and routing tools help you get more done - as much as an additional job per technician, per day. 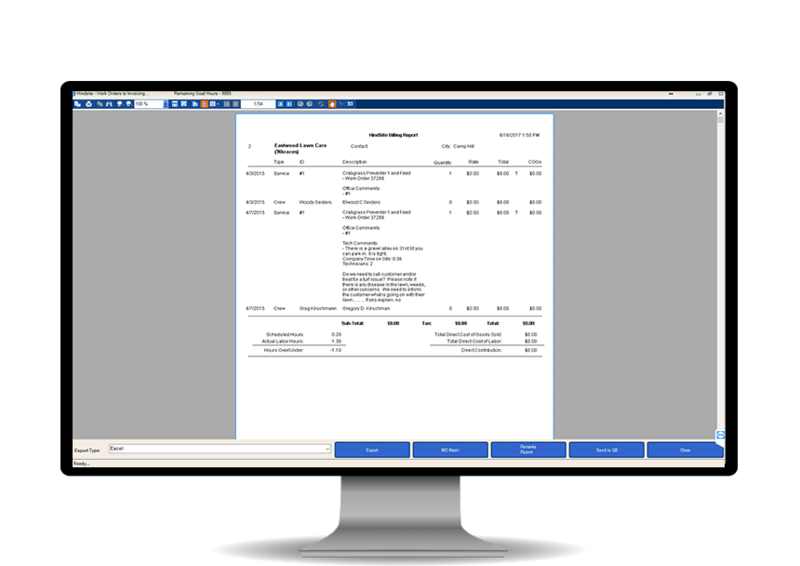 With HindSite, you'll eliminate paperwork, duplicate data entry and windshield time. It's all time you can use to improve the efficiency and productivity of your HVAC business. Studies show that HindSite customers grow faster than their industry peers. Why? Because they're more productive and deliver a better customer experience. If you have annual maintenance contracts, you know what a pain managing those contracts can be. HindSite makes it easy to electronically track contract details and manage every aspect of your maintenance contracts. Save time and streamline your business by electronically capturing and storing your HVAC maintenance contracts in HindSite. Because you're storing contracts electronically, scheduling them all in the spring, fall, or whenever you perform your scheduled maintenance is as easy as selecting the contracts, adding them to a pending list, and then using a map to efficiently schedule them. 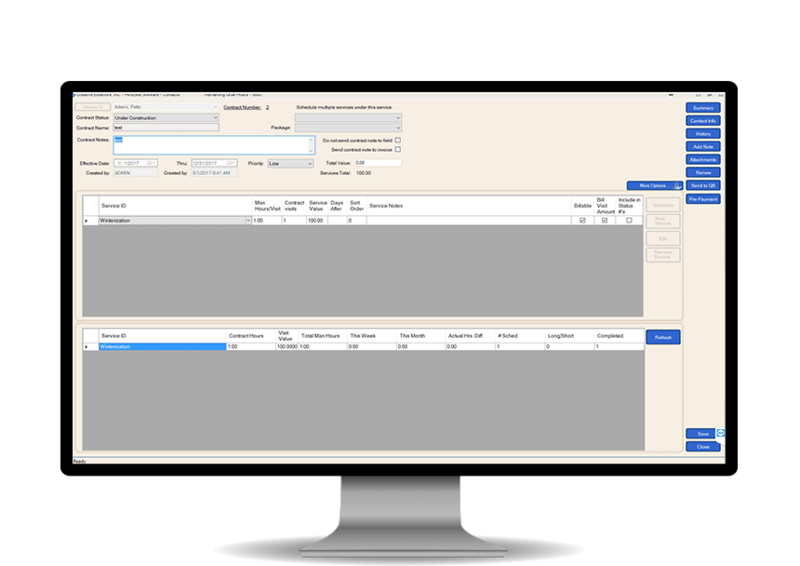 If you use multiple contract tiers - like Gold, Silver and Bronze - HindSite makes it easy to setup the services, frequency and billing rules for each contract type. Whether you're scheduling a one-time service call or mass scheduling your HVAC maintenance contracts, HindSite simplifies scheduling and routing for your team. 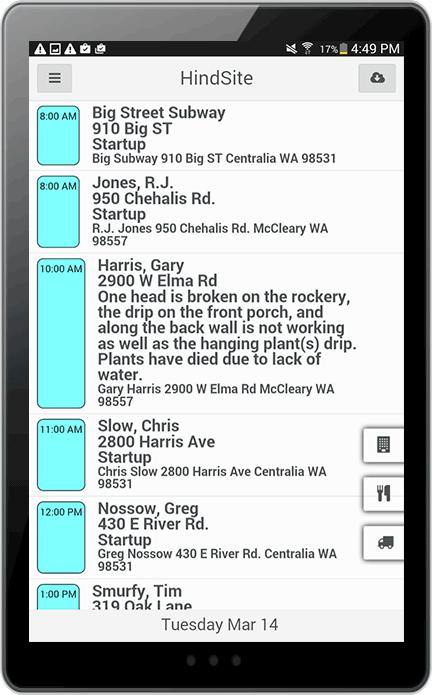 HindSite's daily screen is designed to help you quickly schedule repairs. You can quickly look up customers, find a technician who will be in the neighborhood and quickly schedule the service. It's a huge time saver. It's easy to grab a bunch of customers, like those who are in your Gold HVAC service contract tier, and schedule them. 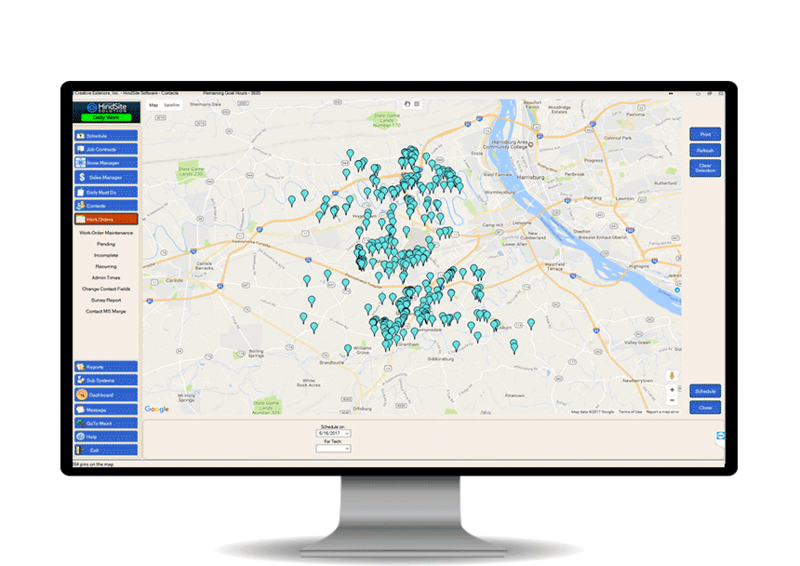 Even better, you can schedule efficiently by seeing all those customers on a map, and grouping neighborhoods by technician and day. Routing your day is a breeze, which is especially useful when you've used our mass scheduling tools to add jobs to your schedule. Simply click the route button and we'll route those jobs in the most efficient manner possible. If you do any time and material jobs, HindSite is a lifesaver. Even if you don't, HindSite's field app delivers the information your technicians need - like a service history and detailed notes - to make quick work of every job. The HindSite field app takes all your customer data - names, unit information, service history - and puts it in the palm of your technicians' hand. Plus, you can send messages, job notes and more, improving the communication from the office to the field. Whether you need to collect time and material records or want something more - like pictures of your work - HindSite can capture the information you need to manage your business. HindSite's assessments enable you to capture virtually any piece of information you need in the field. They're great for checklists, quality control checks and more. Whether you do time and material or flat-rate billing, HindSite's flexible billing and two-way QuickBooks sync simplifies billing. Our advanced, two-way sync between HindSite and QuickBooks makes it easy to send data to and from QuickBooks, eliminating duplicate data entry. Whether you do time and material, flat-rate or contract billing, HindSite's got you covered. Plus, everything from trip charges to variable technician billing is easily supported. Leverage all the data you're collecting in the field and our two-way QuickBooks integration to automatically build better, more informative customer invoices. Your customers will love the way HindSite helps you communicate every little detail. Plus, HindSite helps you be more responsive to your customers, which is the best way to grow an HVAC business. With HindSite's email add-on, HindSite Connect, you can send appointment confirmation emails when you schedule a job, appointment reminder emails the day before the scheduled appointment and send an email when the job is completed. It's the easiest way to communicate every little job detail to your customers. 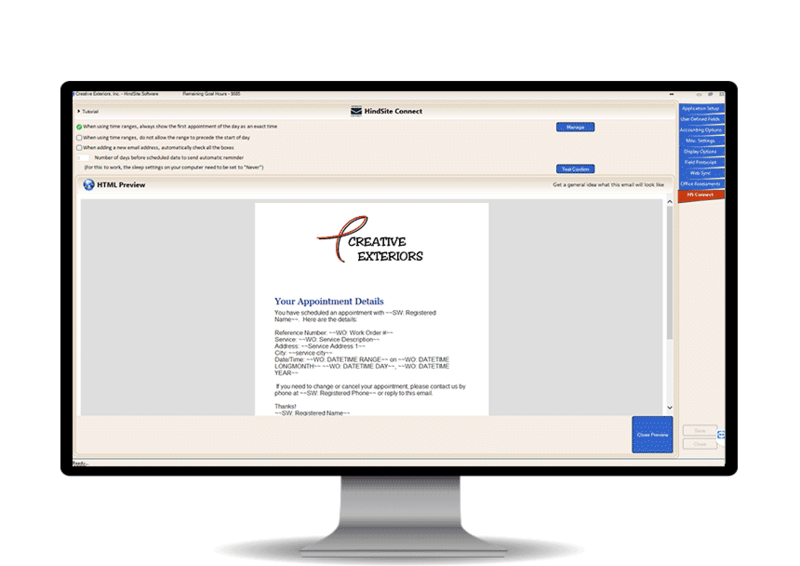 Armed with detailed job notes and a complete customer history, you'll be able to service customer properties better. If you've ever forgotten to complete a customer job or failed to follow-up on a service request, you know how bad it makes your business look. With HindSite's tracking tools, you'll never experience that embarrassment again. With HindSite's asset functionality, you'll be able to track each HVAC unit separately. It's great for commercial properties with multiple units. With HindSite, you'll be able to setup multiple assets for a single customer. It makes it easy to track the model name, model number, serial number and more. Where most software solutions keep information by customer, HindSite can help you track service by HVAC unit. Whether you need to look up unit information in the office or the field, HindSite's got you covered.